The Tarawa Climate Change Conference (TCCC), took place from November 9th -11th in Tarawa, Kiribati, a highly threatened atoll in the Ocean Pacific. It concluded with the release of the Ambo Declaration that was endorsed by Australia, Brazil, China, Cuba, Fiji, Japan, Kiribati, Maldives, Republic of the Marshall Islands, New Zealand, Solomon Islands, and Tonga. Canada, the United States, and the United Kingdom, attended the conference as observers, yet did not sign the declaration. With observer status states are able to participate in the deliberation process. On November 17th, 2010: a new study published by Maplecroft, rated 183 countries on their CO2 emissions from energy use and identified Australia (#2), USA (#3), Canada (#4) as three of the top six nations guilty of the worst performance in relation to CO2emissions. Furthermore the group of 6 are the only countries rated as ‘extreme risk’ by Maplecroft on the basis of their high CO2 emissions from energy use. The tons of carbon emissions per capita for these countries are as follows: Australia: 20.82, United States: 19.18 and Canada at 17.27. Compare these amounts to the drowning citizens of Kiribati whose per capita emissions are a mere 0.3 tons. The speaker of the Kiribati parliament called for the 18 countries taking part in the Tarawa Climate Change Conference to reach a consensus and agree on common goals. But how do vulnerable countries whose goal is simply to survive, find common ground with the participating major Greenhouse Gas (GHG) emitting countries that demand economic growth be allowed to continue under the current economic system – that being the capitalist system – the root cause of climate change in the first place? Such conferences which have the mandate to seek common ground through consensus, more often than not, lead to the lowest common denominator with the voice of those most vulnerable being crushed. Given that Canada, Australia and the United States are three of the highest per capita GHG emitters in the world, as well as being the leading climate change obstructionists within the United Nations Framework Convention on Climate Change (UNFCCC) processes, it seems reasonable to assume that these three states were in attendance to ensure the vulnerable states would not present a declaration reflecting strong demands at the upcoming climate change conference in Cancun, Mexico. While Canadians understand the consequences of climate change for the world’s most vulnerable, the Canadian Harper minority Government nonetheless muses that climate change is a great opportunity to expand economic growth by further exploiting natural resources in a melting North. Why was it that the world leaders on climate change such as Bolivia and Tuvalu were not in attendance? The non-participation of Tuvalu, which is one of the most threatened island states, and of Bolivia, which has been at the forefront of climate change negotiations should raise red flags and alarm bells. The fact that these world leaders on climate change were either not invited, or they made a conscious decision not to participate, begs the question if one critical purpose of this conference, in the eyes of the major GHG emitting developed states, was an opportunity to undermine Bolivia, as well as, further isolate Tuvalu’s position. 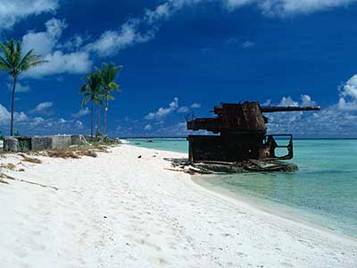 Kiribati Relocation to Nuclear Fall-out Haven? Prior to the conference, the president of Kiribati had indicated he hoped for a legally binding declaration. He also indicated he rejected the notion of environmental refugees. Yet, given that the declaration is neither legally binding nor does it demand strong percentage emission reductions with strong trajectories and timelines, Kiribati may be left with no other alternative than relocation. Thus there is a dangerous new precedent: To absolve major GHG emitting states from fulfilling their obligations under the UNFCCC thus leaving no other option but to relocate citizens at risk. Through their intransigence in refusing to prevent climate change major GHG emitting states have given the vulnerable and developing states an unconscionable option. Is this a modern day revival of the middle age practice of ‘trial by ordeal’? In the middle ages to determine if a person was guilty or innocent – the citizen in question would be thrown into a deep body of water. If the citizen drowned – the citizen was deemed innocent as it was believed that God had received the citizen. If the citizen floated it was believed God had rejected him/her, therefore, the citizen was innocent. In both cases however – the citizen was dead. A dilemma is imposed upon Kiribati: Either the state of Kiribati accepts that its citizens disappear into the ocean due to fact that major GHG emitting developed states have refused to reduce their GHG emissions under UNFCCC obligations or Kiribati citizens are relocated to the highest point of Kiribati, Christmas Island, where there has been irreversible damage caused by the fallout from the nuclear test explosions. Kiribati has been inhabited my Micronesians since 5,000 BP (before present). If the urgent state of climate change is not dealt with, which thus far has proven to be the case, vulnerable and developing states will have no choice but to relocate her citizens. Such forced relocation will result in loss of cultural identity, and most likely the end of their cultures within a few generations. Sandy Gauntlett, Oceania focal point for the Global Forest Coalition, explains that that one such adaptation plan is to move the main part of the South Tarawa population to Christmas Island. There have been several reports indicating the relocation of citizens has already begun. Christmas island was the site of relentless nuclear testing from the mid 1940s to the early 1960’s by Great Britain and by the United States. If this relocation project was discussed during the conference, did the United Kingdom and the United States reveal the nuclear testing information? If so, did this compel the major GHG emitting states to commit to the targets and timelines required to prevent the necessity of the relocation of citizens? The US alone conducted 216 atmospheric tests between 1946 and 1962. 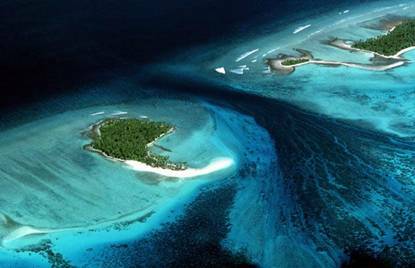 Pristine islands in the Pacific were totally destroyed, at times leaving a mile-wide crater on the ocean floor. Thousands of Polynesians were exiled and left traumatized through generations. The tests between 1952 and 1967 by the United Kingdom in the Pacific Ocean (and at Maralinga, Australia) included over 20,000 servicemen. Among these tests were the “Grapple Y” and “Grapple Z” series of six detonations at Christmas Island in the Pacific Ocean (November 1957–September 1958), consisting of weapons many times more powerful than those discharged at Hiroshima and Nagasaki. Of 2,500 men surveyed in 1999, 30% of the men had died, mostly in their fifties. The survey showed that the grandchildren of these victims endured spina bifida rates more than 5 times the usual rate for live births in the UK. More than 200 skeletal abnormalities were reported and more than 100 veterans children reported reproductive difficulties. It appears that the indigenous victims of the nuclear testing were for the most part undocumented. If such relocation goes forward as the only viable option this must be considered as nothing less than the continuation of the evacuation of indigenous peoples which was carried out beginning in the 1940s. Such atrocities by political “leaders” have now morphed into the calamitous outcome of climate change. It is reported that the world bank was also present in full force in the Tarawa climate conference negotiations. One wonders what role the World Bank played. Perhaps the world bank has assisted with other business ‘opportunities’ such as the new high-tech Guantanamo Bay-style on Christmas Island. Feigned altruism: Major GHG emitting developed states delude vulnerable and developing states into believing that they are genuinely concerned about the plight of citizens at risk. When in fact – these developed states are merely masking self serving interests. Colonialism by Coercion: To ask for less than what is necessary to address the urgency, and to cause vulnerable states to live within the ominous consequences of climate change. The last line of the Ambo declaration supports the Copenhagen Accord which President Anote Tong of Kiribati had previously opposed. The declaration also calls on the world to do more to stop climate change, however, the declaration fails to set any targets whatsoever – indeed, it does not even mention them. Of course, in the declaration, there are promises of adaptation funds. One must consider that the offer of funds in this agreement may have vastly influenced the decision to support the Copenhagen Accord and further, not to demand targets and timelines. Vulnerable and developing states desperately need the world to declare a state of emergency and to undertake the legally binding obligations that will address the emergency. It is imperative that vulnerable and developing states are compensated for years of misuse of atmospheric space and reimbursed for the climate debt that is owed by the major GHG emitter developed states. At this conference, as happened in Copenhagen the pleas and the real demands of the vulnerable and developing states have been ignored. The AMBO declaration is a foreboding of the coercion and backroom deals which will most likely continue to be witnessed in Cancun. It is easy to coerce and bribe states in dire situations of poverty and desperation – especially since those most vulnerable on the front lines of climate change have essentially been abandoned and left to die. Undoubtedly, the vulnerable states were coerced into signing onto the AMBO declaration which is not in their best interest. Further, this declaration must not serve to undermine other vulnerable and developing states which are demanding that the negotiations must reflect the urgency of the emerging science. In the AMBO declaration all signatories including the vulnerable states agree to the Copenhagen accord which cites 2C as an acceptable limit. During COP15 in Copenhagen, a representative from the Intergovernmental Panel on Climate Change (IPCC) stated that at a 2C rise in temperature, the poor, vulnerable and the disenfranchised would not survive, and at 1.5C they might survive. Vulnerable and developing states must avoid the divide and conquer strategies put forward by the major GHG emitters. In addition no longer must progressive developing states be undermined by NGOs that are more concerned about protecting their funding sources and perpetuating their brands than they are about preventing climate change. The world’s only hope at this late stage of the climate crisis lies within the ability and willingness of vulnerable and developing states remain united. It is imperative that the vulnerable and developing states speak with one strong voice and stand up to the major GHG emitting developed states. If vulnerable and developing states continue to compromise and undermine the positions of the strong, unwavering developing states, they will all lose – a guaranteed race to the bottom. A race to global annihilation. If further compromise continues, all states will miss the rapidly closing window of opportunity before the catastrophe becomes irreversible. As climate change worsens and corporate profit from the devastation increases, there will be a corresponding increase in internal conflict as groups battle for land and other resources. If climate change continues to go unchecked – as is happening to date – those most vulnerable such as Tuvalu and Kiribati, will be among the first casualties of massive internal conflicts and perhaps even war over basic resources such as clean water and food. Today, the children of the Atolls are the first victims to suffer and die from diseases arising from lack of fresh drinking water. Kiribati has no fresh water supply left and are therefore reduced to drinking brackish water and bottled drinks, when they can be afforded. This compromised AMBO declaration has undermined the stronger positions expressed by vulnerable states during Copenhagen even though the emerging science indicates that there is an increased state of emergency as the crisis escalates. The following is the declaration as per the Kiribati government with our responses in italics. Because of the global urgency, there must be the political will to return earth’s temperature to its natural pre-industrial level, and strict time frames must be imposed, so that overall global emissions of greenhouse gases will begin to be reversed as of 2011. There must be a global target for greenhouse gas emission reductions of at least 30% below 1990 levels by 2015, at least 50% below 1990 levels by 2020, at least 75% below 1990 levels by 2030, at least 85% below 1990 levels by 2040 and 100% below 1990 emissions by 2050 (please see table 1 for detailed data calculations), while adhering to the precautionary principle, the differentiated responsibility principle *, and the fair and just transition principle. The required reductions in emissions cannot be achieved without an immediate end to the destruction of carbon sinks. Under the UNFCCC, every state signatory incurred the obligation to conserve carbon sinks; thus the destruction of sinks, including deforestation and elimination of bogs must end immediately. The goal of COP 16 must be to return temperatures to pre-industrial levels and return atmospheric CO2 back to 278ppm at the latest by 2050. To succeed in being below the dangerous 1°C, member states of the United Nations must commit to remove CO2 from the atmosphere. It is estimated that to remove the necessary CO2 from the atmosphere, member states of the United Nations would have to commit to removing over 1000GT CO2 by 2050. This must be done through socially equitable and environmentally safe and sound methods and the levels required calculated within an in depth research project. Greenhouse Gas emissions resulting from destructive land use practices including in the rural, the urban and peri-urban environment must end. In order to achieve the required emission reductions, deforestation and the destruction of carbon sinks must end immediately and developing nations whose development will be affected must be compensated. It must be acknowledged that the major contribution to the causing and the exacerbating of climate change is waste and over-consumption; the root cause is corporate capitalism – a destructive model centred on individualism, accumulation of monetary wealth and corporate profits. The Cochabamba People’s Agreement affirmed that “under capitalism, Mother Earth is converted into a source of raw materials, and human beings into consumers and a means of production, into people that are seen as valuable only for what they own, and not for what they are”. AND THAT “Capitalism requires a powerful military industry for its processes of accumulation and imposition of control over territories and natural resources, suppressing the resistance of the peoples”. A paper published in Nature (no. 458) on the 30 April 2009 which is the up to date current science on climate change emission thresholds states that in order to have an 8-37% chance of not exceeding 2 Degrees there can only be emitted 886GT CO2 between 2000 and 2050. Between 2000 and 2010 we have used 363GT CO2 or 41% of the total budget for a high chance of exceeding 2 Degrees. Currently the temperature is at 0.78 Degrees above pre-industrial temperatures and possibly committed to at least 0.6 Degrees of further warming (Lenton et al). At 1.5 Degree Lenton et al suggest that forest dieback will emit an additional 100Gt of CO2, reducing the 886 GT limit to 776GT. In addition, at COP15, a representative from IPCC states that at a 2 degree rise in temperature the poor, the vulnerable and the disenfranchised would not survive and at 1.5 degrees they night. Thus the Copenhagen Accord which put 2 degrees as the limit not only ignored the science but could be deemed to be criminally negligent. An important recent paper by Turney and Jones (Does the Agulhas Current amplify global temperatures during super-interglacials?, Chris S.M. Turney, Richard T. Jones, Journal of Quaternary Science, Volume 25, Issue 6, pages 839–843, September 2010) suggests that at 1.9 Degrees there is a high risk of a rise in sea levels of between 6.6 and 9.4 m and serious disturbance to regional ocean circulations that can amplify warming effects. Based on these facts it is clear that an agreement must be reached this year. 4. From the declaration: Ongoing commitment to the principles and provisions of the UNFCCC, the Kyoto Protocol, the Bali Road Map mandate and to building on the political understandings of the Copenhagen Accord. Recognizing the failure of the Copenhagen Accord to discharge the obligation under Article 2of the UNFCCC, the signatories incurred the following obligation; “stabilization of greenhouse gas concentrations in the atmosphere must be at a level that would prevent dangerous anthropogenic interference with the climate system. The entrenched immovable national interests have served to block serious legally binding instruments in Cancun; must be prevented from blocking the adoption, in the General Assembly, of a strong legally binding agreement on climate change. Article 18 of the Charter of the United Nations reads: “Decisions of the General Assembly on important questions shall be made by a two-thirds majority of the members present and voting. These questions shall include recommendations with respect to the maintenance of international peace and security.” Undoubtedly, the impact of climate change could be deemed to fall under this category. In Cancun, given the urgency of the issue of climate change, and its potential effects on the global population and on the political, economic, ecological and social global systems, the requirement for consensus must be waived, and a binding agreement on all states will be deemed to exist, if 66 % of the states concur. It is possible that a majority of the member states could agree to a strong legally binding “Cancun protocol” to the UNFCCC. A strong Protocol to the UNFCCC could then be used against the delinquent states, and a case could be taken to the International Court of Justice under the UNFCCC, which has been signed and ratified by 192 states. Even most of the delinquent states including Canada and the US, have signed and ratified the UNFCCC. If not 66%, then the proposal made by Papua New Guinea at COP 15 should be in place in Cancun; the proposal was that the state parties to the Convention should strive for consensus with a fall back on 75%. It should be noted that the UNFCCC was adopted by 150 of the then188 members of the United Nations (79%) and that under article 2 of the Montreal Protocol, Parties can if all efforts at consensus have been exhausted, and no agreement reached, adopt decisions by a two-thirds majority. 6. From the declaration: Acknowledgement that there are elements of common ground in the negotiations that can be agreed on to form the basis of action in the immediate term, elements which when implemented will reduce the vulnerability and enhance the resilience and adaptive capacity of developing countries, in particular, the most vulnerable States on the frontline, especially Small Island States, Least Developed Countries and those countries susceptible to drought and desertification. Unfortunately the search for common ground will leave out many of the strong positions that are advocated by many developing states – the keeping of the rise in temperature below one degree and the returning to 300 ppm – a position that would not be agreed to by the major greenhouse gas emitting states. Or the reductions necessary to address the urgency. It is quite clear that years of land degradation and loss of biodiversity have resulted from decades of unregulated exploitation of natural resources by multilateral corporations. Furthermore, it is past time for the global community to revoke he charters and licences of multinational corporations that have violated human rights, denied social justice, contribute to war and conflict and destroy our environment. Given the significance of forest biodiversity, there is now a moral imperative to have a strong forest protocol to be linked to the convention of biodiversity and the UNFCCC. 8. From the declaration: Recognise the connection between low cost, sustainable adaptation and mitigation options and maintaining a healthy biodiversity and urge all nations to use aspects of biodiversity to increase their climate resilience and pave the way for cost-effective, environmentally friendly and sustainable development especially in the most vulnerable States in the frontline and further support the initiatives to implement the outcomes of CBD COP 10 including the CBD Biodiversity Strategic Plan 2011-2020. The emphasis should be on socially equitable and environmentally sound development not on ‘cost- effective’ and to avoid false solutions such as nuclear and biofuel. All states must ratify the CBD, and those who have signed but not ratified must not, as per Article 18 of the Convention on the law of Treaties, defeat the purpose of the Convention on biological diversity. discharge the following obligations; “stabilization of greenhouse gas concentrations in the atmosphere must be at a level that would prevent dangerous anthropogenic interference with the climate system; invocation of the precautionary principle, and of the common but differentiated responsibility principle. Industrialized states and major greenhouse gas producers must be prepared to enter into binding obligations not only through targets and time frames but also through funding mechanisms. This fund could be named Fund for the Implementation of the UNFCCC, and it would fund socially equitable and environmentally safe and sound energy renewable energy, transportation, agriculture and forestry. This fund would replace the GEF as the main source of funding for the UNFCCC. This international fund would take funds traditionally distributed not only through the GEF but also through the Bretton Woods institutions, such as the International Monetary Fund and the World Bank, and additional bilateral funds, and now be channelled through this global fund. This fund would be indispensable for preventing climate change, and for achieving the objectives of the UNFCCC. Additional funds must be derived from reallocation of global military expenses, including budgets and arms production; at the 1992 United Nations Conference on the Environment and Development, all member states of the United Nations agreed, in Chapter 33 of Agenda 21, to the reallocation of military expenses. Additionally budgetary sources for this Fund would be the redirecting of subsidies from socially inequitable and environmentally unsound non-sustainable energy. The financial deal mustinclude the cancellation of the outstanding debt of developing states, and the implementation of the minimal long-standing commitment of 0.7% of GDP being transferred to Overseas Development (ODA). The 0.7% obligation for development must not be diverted to climate change; there must be an additional obligation of more than 7% of GDP specifically designated for addressing climate change prevention. Any shortfall in funding should be bolstered by increased ODA by nations that inequitably have gained an advantage from historical emissions or reduction scenarios that are not in line with the principle of equity. It is necessary to not only prevent natural disasters but also NA-TECH disasters such as those related to the natural disasters caused by the intrusion of technology and resource extraction by multinational corporations. The emphasis must be on establishing a legally binding protocol that will address the current state of emergency brought about by climate change. A state of emergency must be declared in Cancun. This will entail the specific necessary percentage reductions of greenhouse gas emissions with necessary time lines which will lead to the transition to a zero carbon society. See number 1. This included the absolute imperative to maintain the rise in temperature to below 1C and the parts per million to return to 300 ppm back to pre-industrial levels. Criminal Effects of Climate Change The Global Humanitarian Forum Climate Change Human Impact report that summarised data including that issued by WHO on the impacts estimates that in 2009, 325 million people were seriously affected by climate change (based on negative health outcomes), and there were 303,000 deaths as a result of climate change. It predicts that in 2030, 660 million people a year will be affected by climate change and that 471,500 people will die from climate change. These factual estimates invoke very serious legal obligations for immediate action based on the current science. Action that will knowingly cause deaths which number over 10 million must be treated as crimes. Climate change could kill 250,000 children next year, and the figure could rise to more than 400,000 by 2030, according to a report by Save the Children, Feeling the Heat. As a representative from Bangladesh states; for the developed states it is a matter of life style but for Bangladesh it is a matter of survival – a right to live. Militarism: The IPCC and COP have not separately calculated the impact of militarism on greenhouse gas emissions At the same time the dangers related to climate change, and the potential security implications related to resource conflict, and militarism has to be addressed. There is a disturbing link between foreign refusal to supply fossil fuel for the consumption of developed states being deemed to violate “strategic national interest” of developed states and the possible result of military intervention. ***Given that the AMBO declaration and the Copenhagen Accord are not legally binding, the developed states must not use this declaration and accord to undermine the resolve of progressive developing states. Hi Cory. Thank you for this article. Would you know how the country participants were selected? Also, how were the delegates – presumably the small island states, in particular – “were coerced into signing onto the AMBO Declaration” when the document is supposed to be a product of plenary deliberations that they are most definitely party to? Does this suggest that the United States and the United Kingdom, despite their observer status, dominated the talks?